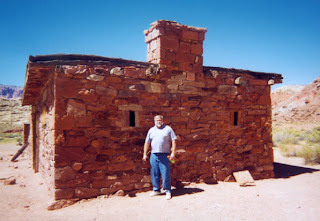 Nick Priznar, engineering geologist extraordinaire for the Arizona Dept. of Transportation, is back at work after recovering from breaking his leg at the Gonzales Pass landslide this summer. Welcome back, Nick! 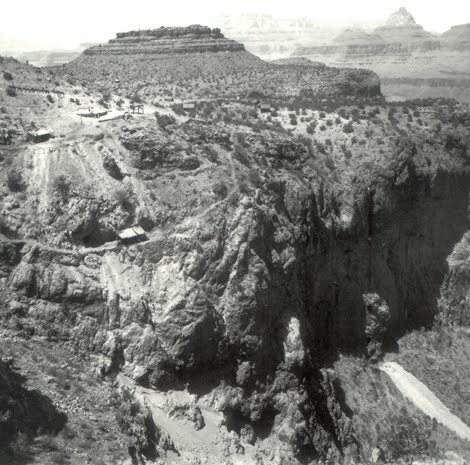 Researchers Owen Shufeldt and Karl Karlstrom of the University of New Mexico, George Gehrels of the University of Arizona, and Katherine Howard of the University of Adelaide present results from a detailed geochronologic investigation of one of the oldest rock units of the Grand Canyon, the Vishnu Schist. 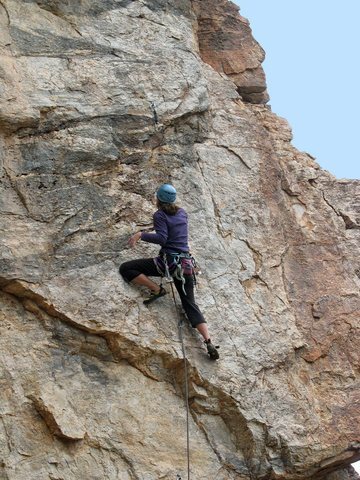 Their data reveal a large population of minerals that range from 1 to 2 billion years older than the rock itself. The ages of these minerals suggest an exotic source for the sedimentary material that became the Vishnu Schist. Possible provenances include Australia, North China, Antarctica, or older blocks within southwestern North America that are not presently exposed. The new data provide evidence for a more complex tectonic history of the southwest United States than presently accepted, including input from nearby cratons and the possibility of undiscovered ancient blocks mixed in with the Proterozoic terranes of southwestern Laurentia. AZGS geologist Brian Gootee reports he's been in that mine at least 20 times. He notes that the ore body is in a breccia pipe which also contains uranium. A century ago the miners took the copper and gold but saw no value in mining the uranium. Today, northern Arizona is recognized as one of the richest uranium areas in the world. The National Council for Science and the Environment (NCSE) and its partners, Boston University and Louisiana State University, have created a resource that will allow you to explore these questions and others, as well as to contribute your own expertise. The OCEAN-OIL website is seamlessly integrated into the Encyclopedia of Earth (www.eoearth.org), which is a free, peer-reviewed, searchable collection of content about the Earth, its natural environments, and their interaction with society, written by expert scholars and educators. NCSE coordinates the Encyclopedia. 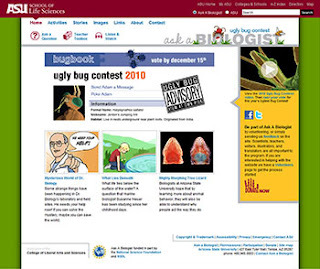 Congratulations to the "Ask A Biologist" website [right] hosted at ASU. 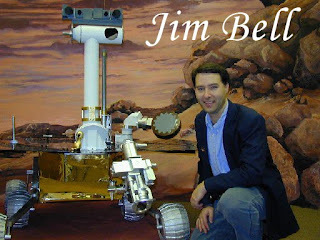 It just won the AAAS Science Prize for Online Resources in Education (SPORE) prize. The Arizona Daily Star reports that "The website was set up 11 years ago to answer questions about biology from schoolchildren. 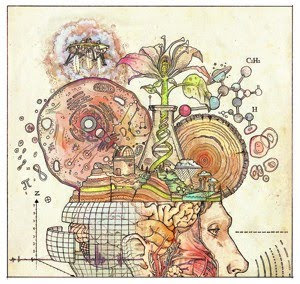 It has grown from a single page in 1999 to a 2,500-page cornucopia of science stories, puzzles, podcasts, cartoons, activities and instructional materials. It now attracts 1 million unique visitors each year," with 150 scientist volunteers helping to answer questions. And belated kudos to the UA College of Science for their 32-page supplement [right] published in the Daily Star on Nov 14, showcasing "Science: Exploring Our World and Ourselves." UA science dean (and geologist) Joaquin Ruiz introduced the magazine with the editorial "Tucson is a science city." 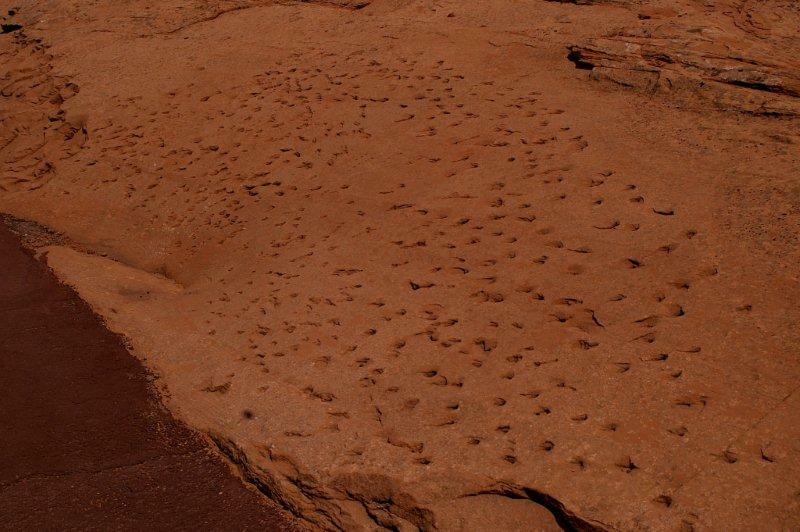 Articles came from UA faculty including topics such as the Phoenix Mars mission, caves and climate, making mountains, the Mars HiRISE mission, and tree ring research. 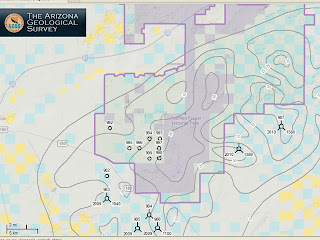 Last week I reported that the USGS had posted 5,000 mineral resource dockets online including hundreds for Arizona but Jon Spencer noted that the USGS map shows nothing for La Paz County in western Arizona. He quickly figured out this is because La Paz County split off from Yuma County in 1983. It is not because there are no dockets for mines and prospects in La Paz County. Some mines for which there are dockets, such as the Three Musketeers tungsten mine, are now in La Paz County but were in Yuma County when the USGS mineral resource programs were in effect, from 1950 to 1974. You have to search for La Paz County mines in the Yuma County listings. AZGS now has more than 300 of our publications online as digital documents for free viewing or downloading. Mike Conway, Chief of the AZGS Geologic Extension Service, is adding documents weekly and says hundreds more are in the process of being digitized for posting. The AZGS Document Repository is a complementary site to our increasingly popular web site. It will also become part of the enterprise (Survey-wide) server node in the growing Geoscience Information Network we are building in partnership with the Association of American State Geologists and the U.S. Geological Survey, with funding from USGS, National Science Foundation and U.S. Department of Energy, Geothermal Technologies Program. Passport Potash says they signed a mineral property option agreement with Sweetwater River Resources LLC and American Potash LLC to acquire five more exploration permits. The company says the new area links their state trust land leases to leases on the east side of the Holbrook basin. Passport reports they control mineral rights on approximately 87 square miles of land making them the largest landholder exploring for potash in the region, with 14% of the potash underlying the basin. 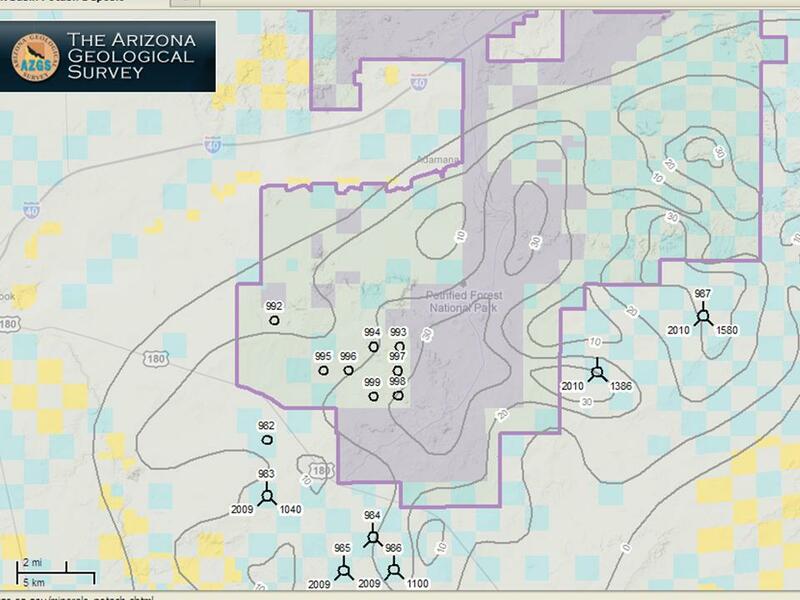 Passport earlier said they will begin drilling shortly on their 8 active drilling permits in the play [right, open circles as shown on AZGS interactive potash viewer]. Hydraulic fracturing of shale gas reservoirs dominated the agenda and the discussions at the annual meeting of the Interstate Oil and Gas Compact Commission that held its annual meeting in Tucson last week. Fears of frac’ing impacts on ground water are being fanned by sensationalist news stories, particularly on the East Coast. 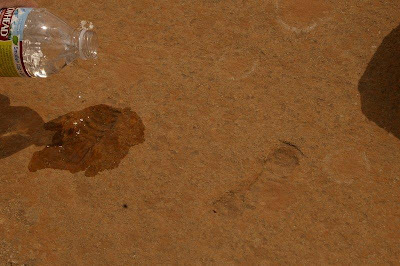 Even in states where frac’ing has been standard practice for decades without controversy, there is rising public fear. 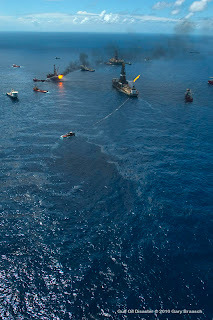 This has become the latest battlefield in a long-standing war over state vs federal primacy for oil and gas regulation. The IOGCC is comprised of 38 oil and gas producing states and serves as a forum for state regulatory agencies to collaborate and offer a common voice to the federal government. 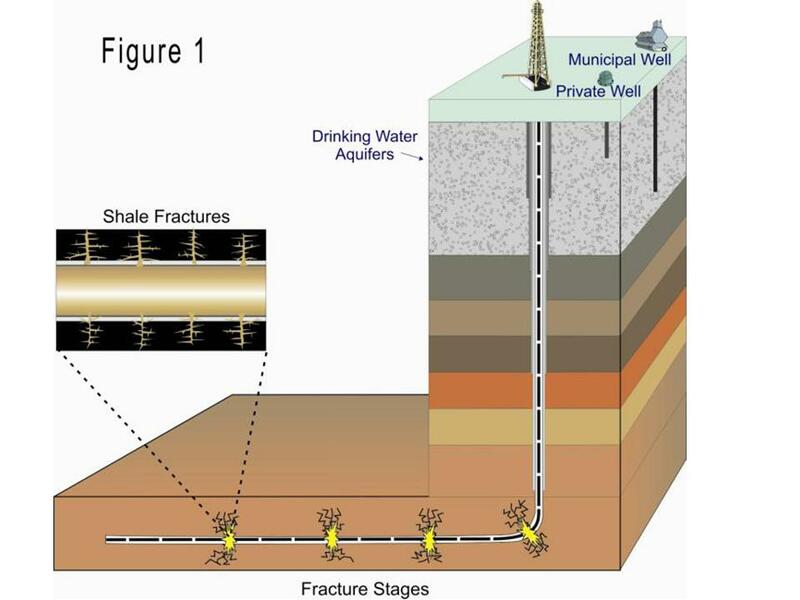 Congress has ordered the EPA to do a study on the impacts of hydro-frac’ing as a result of public fears rising as shale gas deposits are frac’ed. The scoping of that process is just winding up. Many of the state regulators I listened anticipate a heavy-handed federal intrusion that is based on assuaging political pressures rather than being based on the facts and reality. Cynicism and frustration permeated the IOGCC meeting. IOGCC is partnering with the Ground Water Protection Council to establish a national registry of chemicals used in hydro-frac’ing that is in beta mode and should go public in the next few months. This is a voluntary effort where companies involved in frac’ing will release the details on the chemicals that go into the hydrocarbon bearing layers. Opponents of frac’ing claim the chemicals are damaging water wells. But I heard state officials challenge horror stories as not being able to be substantiated. Some of the state regulators described situations of panicked water well owners in their states claiming contamination as soon as plans were announced for shale gas wells, even before they were drilled let alone frac’ed. Gas drillers are being urged to test aquifers and nearby water wells to establish base conditions prior to drilling and frac’ing. There are reports circulating that groups will be targeting certain oil and gas companies in Rocky Mountain states next year as part of a campaign to build political pressure for national restrictions on frac’ing to coincide with release of the EPA study and the 2012 elections. 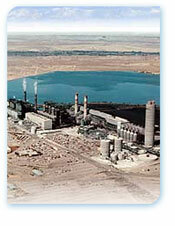 Hydro-frac’ing has not been an issue in Arizona. There is no shale gas development like in Pennsylvania or New York. A few carbon dioxide wells were frac’ed in the St Johns area a couple decades ago but the tests were not successful and the current development in that area has not proposed using it again. However, frac’ing might be considered here for carbon sequestration wells or Enhanced Geothermal System (EGS) projects, although there are no proposals for this at present. 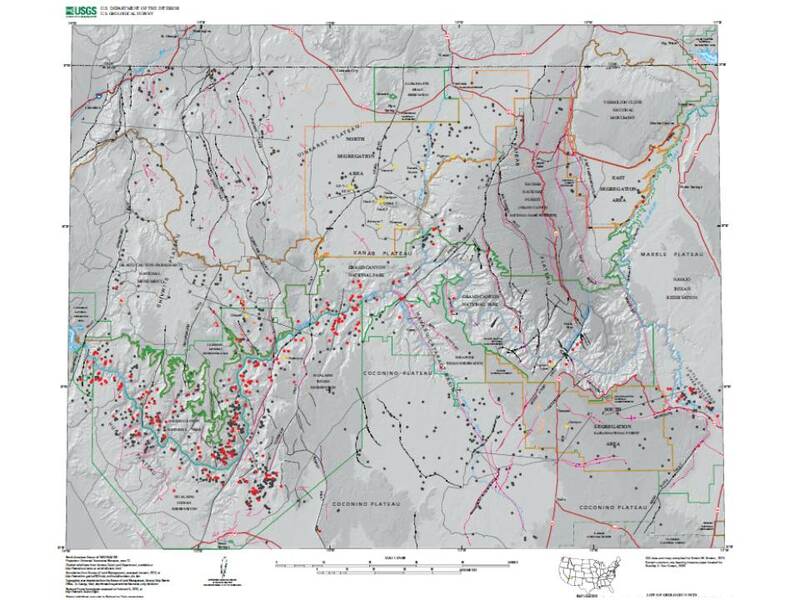 AZGS released a new surficial geologic map of the Empire Ranch quadrangle in the Santa Rita Mountains, south of Tucson. The 1:24,000 scale map by AZGS geologist Joe Cook is posted online in our digital document repository. The map covers piedmont, and stream channel and alluvium deposits of the quadrangle. The mapping was done with cooperative funding from the USGS under the Statemap program. The Empire Ranch quad covers part of the area of the proposed Rosemont copper mine. We completed the bedrock part of this and the adjacent Helvetia quad last year and provided them the US Forest Service to provide insights into geologic issues affecting the mine project EIS. 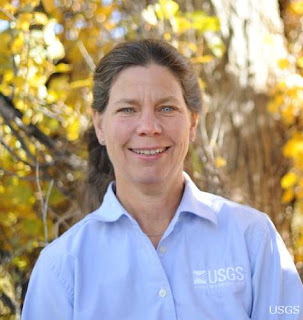 The USGS appointed Kate Kitchell as director of the Southwest Biological Science Centers which has offices in Flagstaff, Tucson, and Moab, Utah. The announcement said that "before joining the USGS in 2005, Kitchell was the Bureau of Land Management’s Deputy State Director for Resources in Utah, serving 16 years with the Bureau and the previous 10 years with the National Park Service." Headquartered in Flagstaff, Ariz., the science center "is home more than 100 federal and university scientists and staff who conduct research to meet the needs of resource managers and society in the context of rapid social and environmental change throughout the Southwest. Research areas include Colorado River ecosystems, the effects of climate change on wildlife, the functioning and resilience of dryland ecosystems, ecological implications of renewable energy development, and the effects of border security activities on ecosystem health." This looks to be a real treasure trove of materials to sort through. Congress enacted the Defense Production Act in 1950 to provide funding and support for the exploration and development of critical mineral resources. From 1950 to 1974, three Department of the Interior agencies carried out this mission. Contracts with mine owners provided financial assistance for mineral exploration on a joint-participation basis. These contracts are documented in more than 5,000 “dockets” now archived online by the U.S. Geological Survey. This archive provides access to unique and difficult to recreate information, such as drill logs, assay results, and underground geologic maps, that is invaluable to land and resource management organizations and the minerals industry. An effort to preserve the data began in 2009, and the entire collection of dockets was electronically scanned. The scanning process used optical character recognition (OCR) when possible, and files were converted into Portable Document Format (.pdf) files, which require Adobe Reader or similar software for viewing. 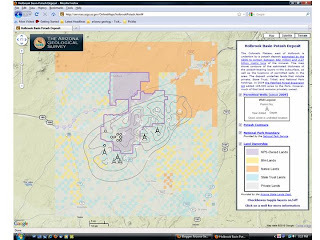 In 2010, the scans were placed online (http://minerals.usgs.gov/dockets/) and are available to download free of charge. 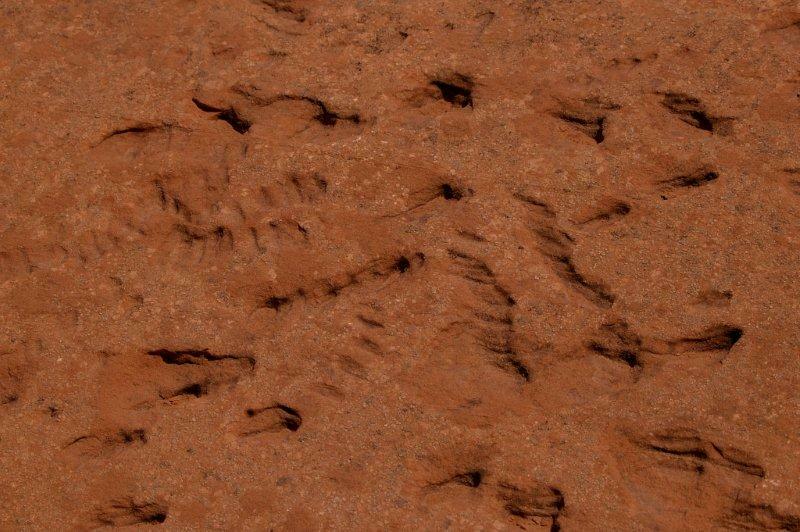 Passport Potash company announced that they will start drilling exploration core holes in the Holbrook basin in December to evaluate potash resources on their leases. 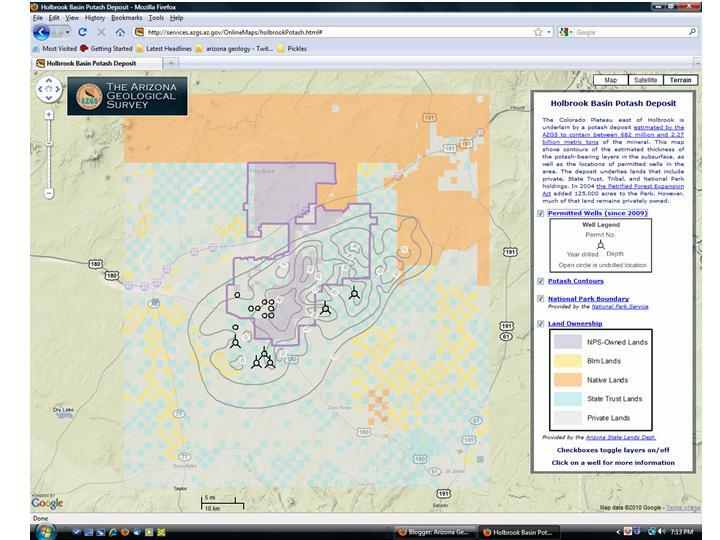 The company permitted 8 wells [right, open circles] with the Arizona Oil & Gas Conservation Commission on lands west of Petrified Forest National Park. Passport also announced they are negotiating with the Karlsson Group Inc. to jointly develop a potash resource on "over 120 sections of state and private lands which total nearly 80,000 acres." 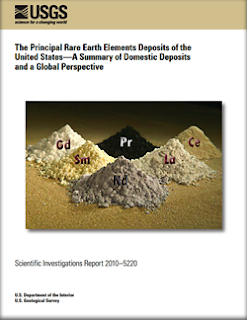 The USGS said today that "Approximately 13 million metric tons of rare earth elements (REE) exist within known deposits in the United States, according to the first-ever nationwide estimate of these elements..." U.S. annual consumption of REEs is currently about 10,000 tons, so if these deposits can be developed, they would help ensure economic and national security for many years. "REE are important ingredients in high-strength magnets, metal alloys for batteries and light-weight structures, and phosphors. These are essential components for many current and emerging alternative energy technologies, such as electric vehicles, photo-volt aic cells, energy-efficient lighting, and wind power. REEs are also critical for a number of key defense applications. 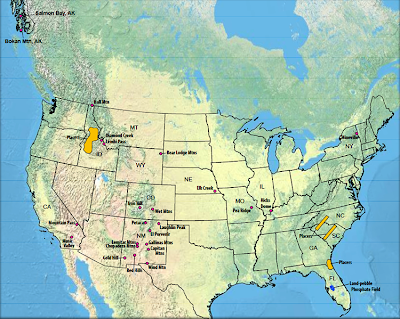 The report describes significant deposits of REE in 14 states, with the largest known REE deposits at Mountain Pass, Calif.; Bokan Mountain, Alaska; and the Bear Lodge Mountains, Wyo. The Mountain Pass mine produced REE until it closed in 2002. Additional states with known REE deposits include Colorado, Florida, Georgia, Idaho, Illinois, Missouri, Nebraska, New Mexico, New York, North Carolina, and South Carolina." 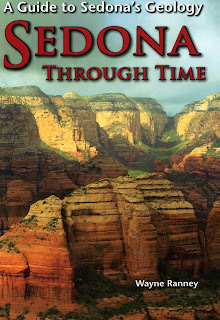 Description: In the American Southwest, transitions from one ecosystem to another can be dramatic and abrupt. This certainly is true in northern Arizona, USA, where the parched Painted Desert, shown here in a palette of purples, adjoins Sitgreaves National Forest (shades of green), a realm of pine woodlands with abundant wildlife. 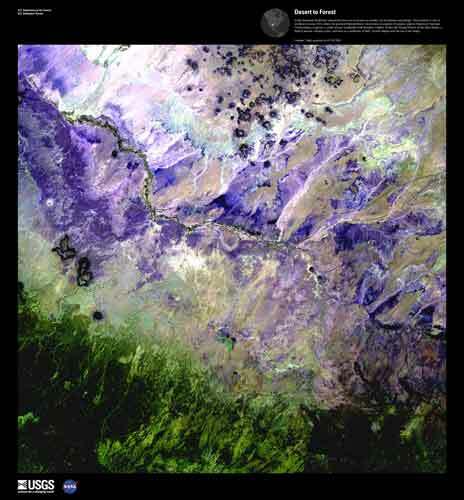 Within the Painted Desert lie the Hopi Buttes, a field of ancient volcanic cones, seen here as a scattering of dark, circular shapes near the top of the image. Admiral Thad Allen launched the 75th annual meeting of the Interstate Oil & Gas Compact Commission being held in Tucson tonight with a casual but ultimately biting review of the Gulf oil leak. Among the tidbits - the Incident Command Center he ran pretty quickly took control of airspace over the Gulf of Mexico. The skies were full of planes ferrying people and supplies to the dozens of vessels working the response, news reporters, other planes were laying down dispersants, and some were sent out by local politicians to find locations where there were no clean up crews so they could swoop in to hold press conferences to show the failure of the response. There were a total of 8 near mid-air collisions. There were also up to 3,000 vessels trying to contain or soak up oil, including many volunteer or local efforts that did not contact or work through the ICC. One truckload of oil containment booms, heading inland for repairs was commandeered by the local parish authorities to prevent it from leaving the area. Adm. Allen lamented that his team had to deal with this kind of counter-insurgency forces. He noted that plans to invest federal funds a couple decades ago to prepare for this kind of event were sidetracked by repeated federal budget cuts. He was using plans and policies developed for a repeat of the Exxon Valdez spill, not what they actually had to face. "The time for R&D is not during a spill." Part of his role was to serve as a referee between the cautions offered by the Science Team and the push by BP to take immediate actions. Among the lessons he shared is the need for full transparency in management, and the need to deal effectively and quickly with volunteers and NGOs, who otherwise turn to the news media with complaints of being turned away. His closing comment brought laughs? "The best thing about Louisiana is that it is so close to the United States." He got a standing ovation from the crowd at the Hilton El Conquistador. ASU professor Paul Davies is co-author of a paper in Journal of Cosmology, suggesting that the initial exploration of Mars be one-way trips for people, just like many colonists left their homes forever in historical times. The idea is getting a lot of news media attention. 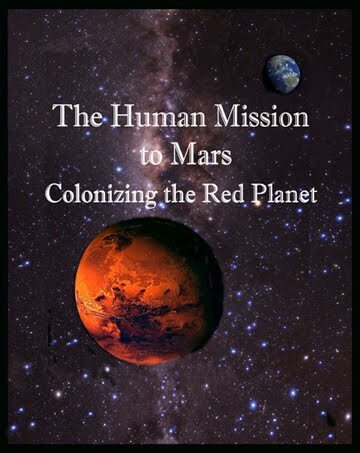 The article is one of many from a new book, The Human Mission to Mars: Colonizing the Red Planet. The Arizona Republic is running a feature story today by reporter Ryan Randazzo examining the future of copper production in Arizona. 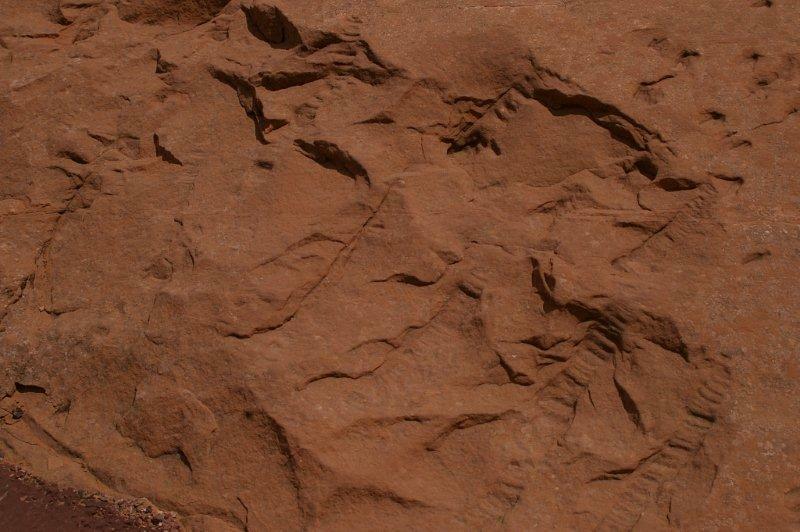 Existing resources could be largely mined out in 25 years or so, but the industry leaders interviewed confirm that Arizona is still highly prospective with lots of potential for new discoveries. The rising price of uranium in response to growing global, especially Chinese, demand is drawing more attention to Arizona resources. In another interesting development, I see that VANE Minerals is focusing their exploration efforts on state lands rather than federal. This seems pretty clearly the result of the withdrawal of nearly a million acres of federal land to mineral exploration last year and fears among companies that investments on any federal lands will be at risk. VANE's CEO Steve Van Nort is quoted saying, "'Since moving our emphasis to the 'state lands', operations are running more smoothly and the state has proven to be supportive of exploration." 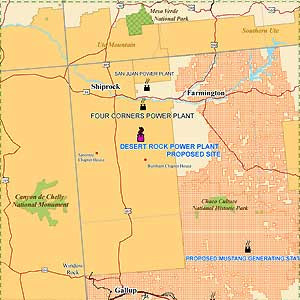 The proposal by Arizona Public Service to buy out and shut down the higher polluting units 1, 2, and 3 of the Four Corners coal-fired power plant and upgrade units 4 and 5 is getting good reviews from New Mexico regulators and support from environmentalists, even the latter say they still want to shut down all coal-fired electric generation. The Kartchner Caverns "Cave Fest 2010" is this weekend with a couple dozen talks on talks ranging from geohydrology of the cave to white-nosed sydrome and bat conservation and fungi in cave ecosystems. All events are free to the public with payment of the standard $6 per car park entry fee or with a tour reservation. There hasn't been enough public word about this event, so spread the word to your friends and family. Cave Fest is part of the park’s and agency’s mission for continuing scientific exploration and discovery, science-informed management of park operations and resources, cave conservation and promotion of public education and scientific literacy. Talks are offered at half hour intervals beginning at 9:00 am and wrapping up at 4 pm Saturday, resuming at 8:45 AM Sunday and ending at 4:40 PM. The Wall Street Journal attributes part of the price rise to a strike at the Chilean copper mine Dona Ines de Collahuasi, which produces 35% of the worlds copper. 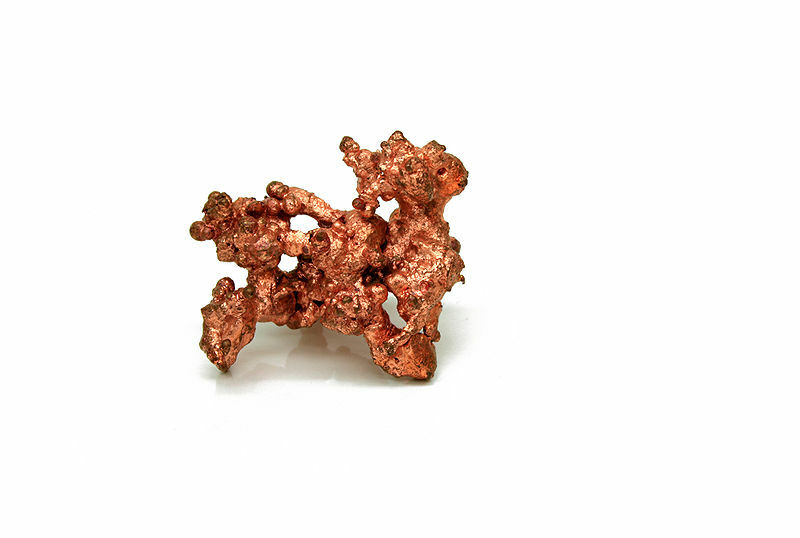 In New York, the December contract for copper closed at $4.0835 per pound. "China has increased its target for nuclear power for 2020 to 112 GW (from 70 GW), well above our previous estimate of 86 GW," according to a report on Mineweb.com, and that is changing the global market for uranium. 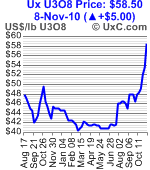 The spot price for U3O8 hit $58.50 this week, the highest in over 2 years. Forecasts through 2018 are for prices in the $75-80 range. Arizona has some of the richest uranium deposits in the world, concentrated in breccia pipes in the Arizona Strip and adjacent areas in the northern part of the state. About 1 million acres of federal lands are currently closed to exploration and development pending the outcome of an environmental impact statement that is in preparation. Exploration companies report finding hundreds of new geophysical anomalies in the region that could be previously unknown breccia pipes, although it's undetermined how many of them could be mineralized with uranium. With the Colorado River basin the focus of attention due to drought, overallocation, and impacts of climate change, it makes sense that the first water census in the U.S. since 1978 will be here. Interior Secretary Ken Salazar announced the project at a meeting in Phoenix of water managers from the seven Colorado River states. The press release said "The study is part of the WaterSMART Water Availability and Use Assessment for the Colorado River Basin. It is planned as a three-year, $1.5 million effort that will provide an inventory of water supply and demand, including water needed to support ecosystems, and report on significant competition over water resources and the factors causing that competition. (The “SMART” in WaterSMART stands for “Sustain and Manage America’s Resources for Tomorrow.”)"
The Secretary also used the occasion to announce that the Department of the Interior chose the University of Arizona as home base for a regional Climate Science Center. “The consortium headed by the University of Arizona brings a wide range of scientific and impact assessment capabilities to the Southwest Climate Center because it includes institutions located in and familiar with the incredible diversity of ecosystems and human settlements and activities that characterize the U.S. Southwest,” the Secretary noted. The consortium is well versed in issues such as coastal management, drought and its impacts on people and the environment, water management in the Colorado and other Southwest rivers, and the impacts of exploding populations of bark beetles on western forests. Meanwhile, given that the Democrats loss of the U.S. House probably means that Rep. Raul Grijalva's proposed legislation to ban mining (and inexplicably geothermal energy as well) on federal lands in Pima and Santa Cruz counties is not going anywhere when Congress reconvenes. Both Mr. Grijalva and Rep. Gabby Giffords, opponents of the Rosemont mine, were re-elected, defeating opponents who favored it. Rosemont released a poll last month that showed strong public support for the mine among residents of Pima, Santa Cruz, and Cochise counties, that increased when the economic benefits of the mine were presented. Readers, we need your help. 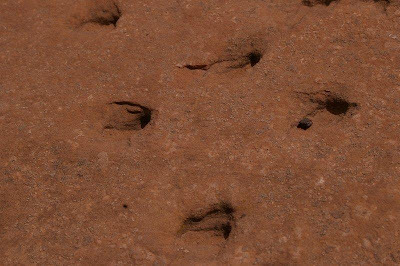 Some time ago, we received these photos of unusual features in what appears to be the Betatakin section of the Navajo Sandstone, asking if we could identify their origin. The features are not on bedding planes. 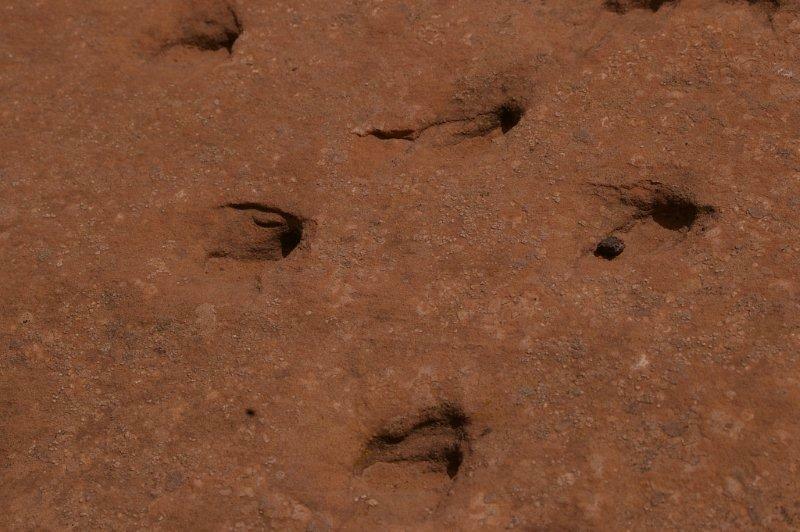 One suggestion is that they could be skolithus-like burrows that created bioturbation. Another proposal is that they are the result of some early but undefined diagenesis of the rocks. Does anyone have an explanation for these features? free cash flow this year of over $6 billion, ahead of analysts predictions of $5B+. The world demand for copper is reaching across Arizona with mines starting up again (e.g., Miama) and the addition of new workers at the Morenci mine. There's an interesting political analysis in the Arizona Republic about the changes in Congress and the resulting impacts on mining in Arizona. Rep. Jeff Flake says that Rep. Raul Grijalva losing his chairmanship of the House Public Lands Subcommittee with the switch in party control, will result in him not being able to continue to hold up the land exchange needed for the Resolution Copper mine near Superior to go forward. [right, Apache Leap area, which is part of the land exchange legislation in Congress. Credit, Resolution Copper]. Interestingly, the land exchange was introduced in the House last session by Democrat Anne Kirkpatrick who represents the Superior area and who was defeated last week in her bid for re-election. Congrats to Flagstaff geologist and author Wayne Ranney for receiving the "Outstanding Publication" award from the Association of Earth Science Editors for his book "Sedona Through Time." It's a great book and nice to see Wayne get the well-deserved recognition. Arizona Public Service announced a deal today for them to buy out the SoCal Edison share of the Four Corners coal-fired power plant near Farmington, shut down the older, less efficient units 1, 2, and 3, add more emissions control to remaining 4 & 5 units, and redirect the power from new units 4 and 5 to meet local needs instead of going to California according to news reports. The deal needs Az Corporation Commission approval but on the surface it seems like something that appeals to everyone. The plant continues to meet the regions energy needs, hundreds of jobs and significant revenue continue for the Navajo Nation, emissions are drastically reduced. Lake Mead hit its all time lowest water level since the dam was built, generating a lot of angst and prophesizing. Scientific American posted a follow on story about long term drought forecasts in the Southwest U.S. and other areas. They argue that "a new analysis using a standard drought index augurs that by the end of the century devastating drought conditions will take hold over much of the populated areas of the world." The authors of the study posit that human influence on the climate is still small relative to the natural changes over the past 50 years, although they note that human induced changes are expected to become much more significant. 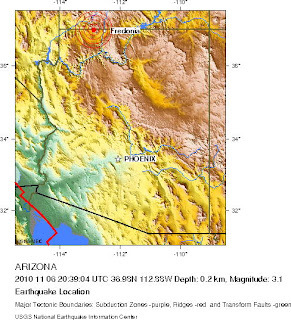 A magnitude 3.1 earthquake occurred at 1:39 pm local time today about 20 miles west of Fredonia, Arizona and just east of Colorado City. The area has a history of small quakes in this part of the Intermountain Seismic Belt. And last week's episode of the CBS tv show Medium has the psychic star foreseeing an earthquake hitting Arizona at 9:18 am. Must be another quake. 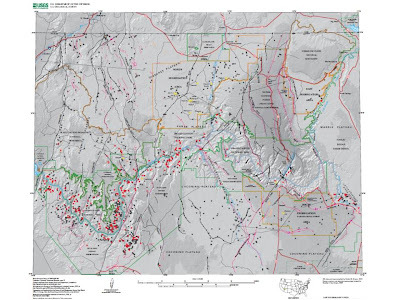 A new report from the USGS finds that regional groundwater contributes about 3/4 of the base flow of the San Pedro River near Tombstone, with 1/4 coming from "summer storm runoff stored as alluvial groundwater for the 2000 to 2009 period." The authors conclude that "Continued regional groundwater pumping will, however, eventually lead to a decline in the contribution of regional groundwater to base flow." Ref: Kennedy, J.R., and Gungle, Bruce, 2010, Quantity and sources of base flow in the San Pedro River near Tombstone, Arizona: U.S. Geological Survey Scientific Investigations Report 2010-5200, 43 p.
They are situated at the bottom of the page and referred to as Phase II Summary Report. The mapping was led by AZGS geologist Joe Cook under contract to ADWR for anticipated use in groundwater - surface water adjudication hearings. 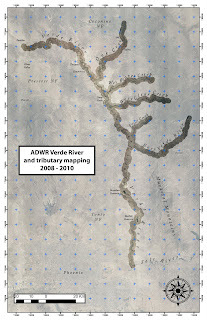 The geologic maps along the main Verde River were previously released by ADWR and AZGS. 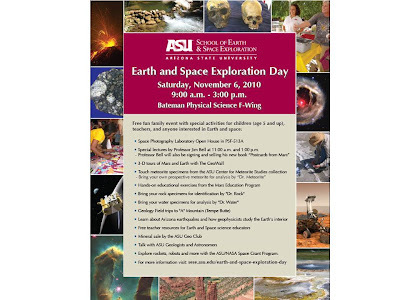 Working my way through hundreds of emails that piled up while I was traveling the past two weeks, I see it's a bit late to share the news that ASU's School of Earth & Space Exploration is holding an open house "Earth & Space Exploration Day" in the Bateman Physical Sciences Bldg on the Tempe campus. It runs until 3pm, so there's time to head over and see the exhibits and let the kids join in the special events for them. NGDS as the "killer app"
The National Geothermal Data System was described as the "killer app" (i.e., application) for the concept of distributed Web services and the Geoscience Information Network (GIN). Matt Harris with the British Geological Survey, offered that interpretation to the participants at the OneGeology-Europe final review in Paris last week, and it was one of those eureka moments. Those of us working to implement GIN as the data integration framework for NGDS are so buried in the project that we may have missed the obvious. GIN is a 3-year old collaboration between the State Geologists (via AASG) and the USGS to build a national distributed geoscience data network. It was adopted by the U.S. Dept. of Energy Geothermal Technologies Program last year for the NGDS with AZGS as the prime contractor to deploy the network nationwide among state surveys and populate it with vast amounts of digital data relevant to geothermal energy exploration and development. The OneGeology-Europe project paid my way to Paris to present an external view in the wrap-up of their two-year project to build a continent-wide data network among 20 nations. In my formal remarks, I applauded the OneGeology project as the continents flagship effort that proved the technology and architectural approach that we are now emulating in the U.S. They have 40 Web services working in 17 languages and are harmonizing geological maps across the borders of Europe. AZGS has been working closely with OneGeology through our geoinformatics chief, Steve Richard, to develop joint vocabularies and specifications so the two continent-wide data systems will be compatible and integrated. From Paris, it was off to Denver for the annual Geological Society of America meeting and an open forum on the emerging National Geoinformatics Community. Dr. Richard Hughes, Director of Information and Knowledge Exchange of the BGS, who was also with us in Paris, reaffirmed the 'killer app' title and declared that the GIN-NGDS project was the most significant project in North America. It's been a busy week for AZGS at the Geological Society of America annual meeting in Denver that wrapped up today. We just finished packing up our new multi-screen digital display at the State Geologists exhibit booth for shipment home. We were running live demos, bringing in maps and data via web services from distributed data providers all over the country as part of our DOE-funded Geothermal Data project in the National Geothermal Data System. We appear to be pushing the commercial software to its limits but are working with company technical staff. Erica Bigio, part-time scientist at AZGS who is also working on her graduate degree at the University of Arizona, received two awards at the Geological Society of America annual meeting in Denver tonight. The Quaternary Geology & Geomorphology Division gave her the Robert K. Fahnestock Memorial Award as well as the Marie Morisawa Research Award Honorable Mention. The Robert K. Fahnestock Memorial Award is made annually to the applicant for graduate student research grants with the best application in the field of sediment transport or related aspects of fluvial geomorphology. The Marie Morisawa Award for $1000 was established in 2006 to honor Dr. Marie Morisawa, one of the first women to maintain a high profile in Quaternary geology and geomorphology throughout her career. The purpose of the award is to support promising female M.S. and Ph.D. graduate students pursuing a career in geomorphology.